ABAC are one of the UK's leading supplier of compressed air technology. ABAC offers specialist compressed air products that benefit from over 50 years of technological development. 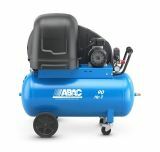 With unrivalled experience in the development of modern air compressor design ABAC have the most comprehensive range of compressed air equipment; designed to offere users a reliable, efficient and durable product that has been manufactured to the highest standard.